Writing: Is That Plot Thickening? A soft female voice speaks behind you. “T’would it be a bother if borrowed a bit of your shade?” she asks. You look up. She’s a slender knife of woman with wavy russet hair, her face is wide and freckled with a sharp upturned nose. She’s dressed in green satin blouse and faded jeans. She’s carrying a stylus and tablet like yours; another student—a writer, or a prospective one anyway. You nod to her and gesture beside you. She smiles and the sunlight glints in her blue eyes. With that hair, her pale skin, and the accent you guess she’s either Scottish or Irish. “Have ya heard what they been saying?” she asks. When discussing plot, many people flash on how stories are typified as being either plot driven or character driven. The truth is that all stories are driven by plot. What they are actually referring to is whatcarries the story. In other words, what aspect of the narrative engages the readers mind? Is it the mystery/tension/intrigue of the world, situation, and events the writer has set up? Or is it the concern/fascination with the characters and wondering what they will do and say next? Both aspects, the story problem and the characters, are key to your story. The elements that dominate or “carry” the narrative are actually just a literary artifice to classify and “type” a story. Such a classification really has no bearing on the techniques, style, or voice used to portray your story. 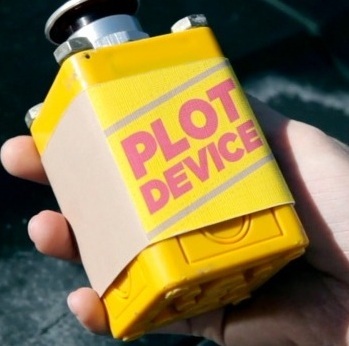 So, what is a plot really? There are many answers, and for purposes of our discussion we’ll use two simple metaphors. The easiest and best way to think of plot is to say “problem”. Both words begin with ‘p’. Simple as that, the plot is the problem that must be solved before the story can end. We’ll expand on that in a moment, because there’s more to it than that. The other way to think of plot is as ‘glue’, the plot is what binds and threads all of your scenes and characters together. Without that glue, your characters would wander around without motivation or goals, they would have no driving need or anything at stake to give them any focus. I use two metaphors here because plot is the problem, but at the same time it also the adhesive that imposes structure on the narrative. Most importantly it gives you a way to know where the story starts and where it ends. The old American cliché, ‘It ain’t over until the fat lady sings’ has been said in dozens of movies. Characters say this line to show fortitude and that they’re still ready to go the distance. It’s also a wink-wink nudge-nudge by the script writer saying to audience— here it comes! It’s isn’t over until that last hurdle is cleared. The story molecule serves two functions in our discussion. One, it’s useful as a graphical representation of the relationships of your different story elements. Two, it works well as a checklist to see if you have the all the aspects of the story structure in mind. To understand how this diagram represents plotting, examine the graphic above. In the center you’ll see a gray rectangle with arcs above and below it. The rectangle represents your story. Remember we said the plot is the problem, and also that the plot is the glue, here is it shown as surrounding and permeating the ‘zone of conflict’ which is the action of your story. Notice that the arc of the central problem connects the beginning and end of your piece. This illustrates how the story starts and terminates with the main conflict. The arc of the theme also spans the entirety of your story. Theme underlies the significant action. Think of the problem and the theme as simply being aspects of the same thing. One example of the theme/problem pairing is a survival story. A man is lost in the wilderness. The problem of this story is survival. The theme of this story is man against nature. We’ll come back to function of theme in a moment. Inside the problem/theme circle is an ellipse labeled ‘Win/Lose’ and below it ‘what’s at stake?’. It is placed in the diagram that way for clarity, but actually represents another sphere surrounding the story. The sphere of consequences; the all pervasive awareness of protagonist’s and antagonist’s actions and what effect they have on the world. Balanced on the edges of the problem/theme sphere are the character forces. Action lines interconnect these forces. The protagonist and the antagonist’s goals are also connected to one another. Likewise the adversary is linked to the protagonist’s goal. As the two strive toward their goals they are pulled together inexorably. Note: the diagram represents only the MAIN action. The same technique can represent multiple protagonists, goals and adversaries all suspended and balanced against one another within the problem/theme/consequences spheres. Let’s use the diagram as a checklist to plot a story now. First, start with the root of the story; the protagonist(s). Who is the protagonist? You must have a protagonist, and if there are multiple main characters, is there one who stands out above the others? Who is the story about? Your protagonist(s) is a person. People have goals. What does the protagonist want and in what way does he/she go about getting it? Can you distill their actions down to a single verb? In the movie E.T., the alien wanted to return to his people. His action toward that goal was to befriend the kids, and create a signaling device to phone home. Remember the protagonist’s goal does not necessary relate to the story’s problem (it can though, and often does). Is the goal enough to challenge your protagonist? These three elements must balance against themselves and the adversarial force. Examine this symmetry carefully. This is where many stories experience difficulties. What is the central unifying problem that permeates the story? The problem must overlay the entirety of the piece. In the two Terminator movies, the unifying problem is the world will experience a nuclear holocaust if the Skynet computer is allowed to come on-line. As with your protagonist’s goal, identify if this problem is enough of a challenge for your characters. What is the adversarial force in your piece? Something must resist your protagonist’s forward momentum in the story. Without struggle, there is no story. What would Star Wars have been without Darth Vader and the evil empire? The adversarial force must be diametric to your protagonist(s). Its goals and actions should balance against the protagonist(s) and their goal. What is the adversary’s goal? Why? One of the most important aspects of tense fiction is consequence. What’s at stake in your piece? What price will be paid if the protagonist fails to achieve his/her goal or solve the central problem. What are the repercussions? The worse the consequences and the greater the awareness of them in the story, the more dynamic the tension will be. Take the movie (or book), The Andromeda Strain, if they failed to find a cure for the virus, it would destroy the majority of the planet’s population. What is the theme of your story? Can you express it in one or two sentences? When you understand your theme, its ramifications to the whole story become tacit. The theme should become a beat (an echo) that metaphorically takes place in different forms during the course of the story. In short work the beat might only be at the beginning and end of the work. In longer pieces, it should reoccur in some form at least three times. An example of such a theme might be ‘love conquers all’—how many movies and books can we think of that put forth that story premise? Once you know all your story elements consider their energy. This is how you know if the plot is a good one. Protagonist and antagonist in opposition generate friction. How much? Is the resulting heat enough to fuel your story? Is what’s at stake enough to keep your protagonist aimed at the problem? What drives the adversary? Is it sufficient to sustain the contention with the protagonist? This has been a fairly generic discussion of how to gather together the narrative elements and sort them into a plot. This overview is to help you visualize and formulate story ideas in terms of structure. In later articles we’ll get more specific as to how to refine and develop these elements individually. We’ll start that process next article where we focus on narrative techniques and how to develop voice and style that is immersive for your reader. This entry was tagged Articles, Beginning Writer's Craft, The Write State of Mind, Writing. Bookmark the permalink.